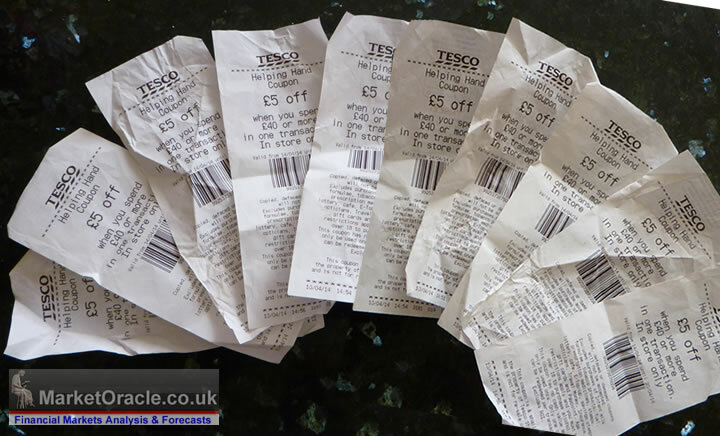 Tesco Empire Strikes Back, £5 off £40 Discount Voucher Spend Explained, Exclusions Warning! For every £40 Tesco customers spend in one transaction they will be in receipt of one £5 off voucher to spend on their next £40 shop. Therefore on face value this implies a £5 discount on a £80 spend amounting to a 6.25% discount. The current promotion runs until 9th of November, following which customers have until Sunday the 16th of November to use their vouchers else they will expire worthless. Clearly the strategy to maximise on the overall discount of 6.25% would be to spend just over £40 before completing each transaction so as to gain the maximum number of £5 off vouchers to utilise before the deadline of 16th November by once more repeating checkouts of just over £40. Unfortunately there will be many customers who whilst attempting to capitalise on the vouchers will find that they are caught out by the small print that despite spending £40 will fail to be in receipt of a printed voucher and that is as a consequence of the long list of exclusions. For instance baby milk, BABY MILK is excluded from the promotion, Why? Apparently it's because Tesco feels it's unethical for mothers to formula feed rather than breast feed, so what about publishing bogus accounts with doctored numbers running in the hundreds millions prompting a criminal investigation? What about the ethics of that? This means that whilst customers can get their spend at just over £40 right at checkout, however AFTER the transaction has been completed they do NOT get a voucher! And there is NO WAY BACK because the transaction has been completed! So in reality many customers who are aiming to play the game of just spending over £40 to maximise the number of vouchers received will fail as a consequence of the long list of exclusions that many will only realise AFTER the transaction has been completed! To help Tesco shoppers here is the official list of exclusions to be aware of as they will not count towards your shopping total in terms of securing a voucher - Infant milk formulae, tobacco products, fuel, prescription medicines, stamps, lottery, cafe, E-Top-up, savings stamps, opticians, travel money, insurance, gift cards and Paypoint. 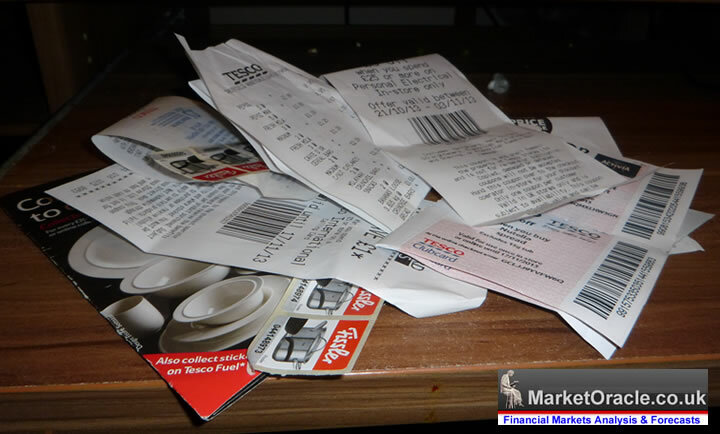 Will the Vouchers Save Tesco? Unfortunately history says NO, for Tesco have so to speak pressed the £5 off Voucher PANIC button many times in the past in response to bad earnings news, so I don't see why this time will be any different, all it will do is just buy Tesco some time ahead of the next bad corporate news story, though off course customers benefit form a potential 6.25% off their shops. My earlier analysis highlighted key measures that Tesco should take to attempt to recover from the black hole that it has been sliding into.